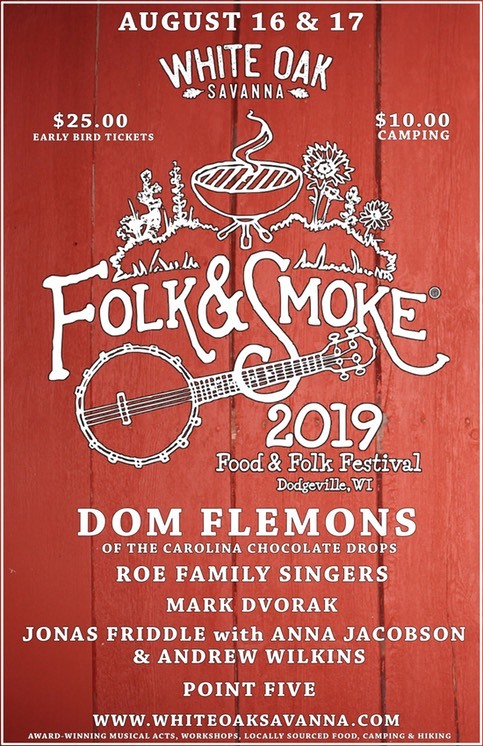 DODGEVILLE WI - The White Oak Savanna Events Farm and Sanctuary will present its first Folk & Smoke Festival on Friday and Saturday, August 16 and 17. The event will feature performances, jamming, workshops and a Friday night sing along. Locally sourced barbecue, food and beverages will also be available. The event takes place at the White Oak Savanna Events Farm and Sanctuary, 4352 State Road 23. Saturday acoustic performances take place from 11:00 am until 10:00 pm and include Don Flemons of the Carolina Chocolate Drops, Chicago’s “official troubadour” Mark Dvorak, the Roe Family Singers, Jonas Friddle with Anna Jacobson and Andrew Wilkins and Point Five. Dvorak will lead the Friday Folk Jam and sing along at 6:30 pm. Admission to the festival is just $25 per adult. Camping on the grounds is permitted and requires a $10 fee. For more information phone 608 636 5776. Order tickets online at www.bit.ly/2VegbeI. Visit the White Oak Savanna Events Farm and Sanctuary at www.whiteoaksavanna.com.